Have you ever tried to clean grease off your range hood and asked yourself, “Is there a better way to do this?”. Well this week I discovered an amazing product you need to check out. Especially if you start to notice funky smells coming from above your stove – like I did this past weekend!!! Your range hood, if working right, is suppose to pull all the fumes from your stove top. Over time the hood and filter will develop a stinky greasy residue that can attract insects. Maybe you’ve cleaned this before but it took more effort than you’d like. I’m all about saving time, getting amazing results, and sharing with my friends. I feel like a kid on Christmas day because I’m so pumped to show you my results. Let’s get to it!!! Too Busy to Clean Kitchen Hoods? Sometimes I want to clean our house but feel way too overwhelmed with life to even get started. As a result, I love getting awesome cleaning tips that take little time and effort. I spotted Super Clean (a degreaser/cleaner) while walking through the automotive department of a huge box store. After reading the instructions I thought it’d be a worthy experiment to try it on our stainless steel range hood. This in no way is a product promotion – I just wanted to see if Super Clean would work and don’t know anyone at the company. I’ve tried other cleaning solutions but they failed miserably. Uh, yah, this is the shortest supply list I’ve ever had. 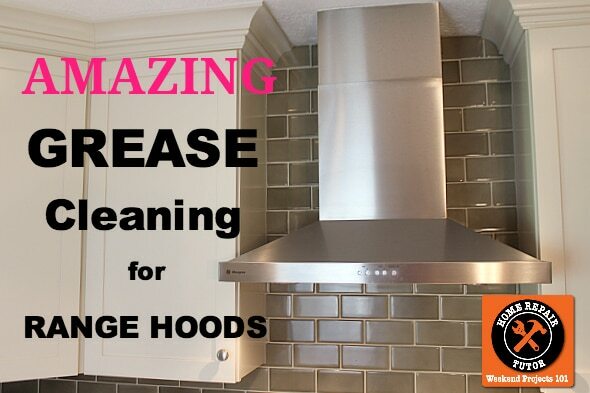 How to clean a greasy kitchen hood and filter like a champ!!! Here’s my step-by-step degreasing process. 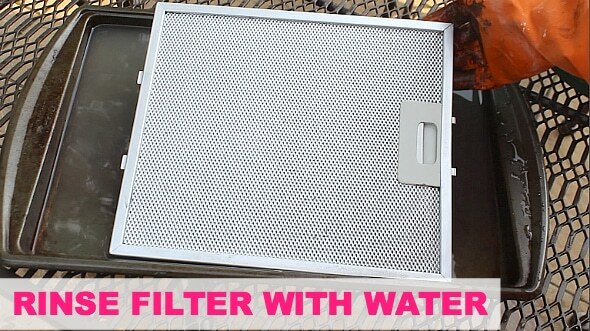 Remove your range hood filter and place it in a baking sheet or kitchen sink. Throw on a pair of chemical resistant gloves. Shake the Super Clean then spray it onto the filter. The grease will instantly start to breakdown but I left the filter sit for about 5 minutes before rinsing it with water (in the video I kind of use an unorthodox method, haha). In that five minutes I went back to my kitchen and sprayed the inside of the range hood. You should always do a pre-test on any surface to see if Super Clean will react well with it. I did this and didn’t see any negative reactions (like the finish being ruined). Good thing too, because my wife would have be a tad bit upset. I didn’t let the Super Clean sit on the range hood for any period of time. You can immediately start wiping down the surface with paper towels. This is what impressed me the most. The grease on the range hood was worse than the filter. Seeing it come right off was like a miracle. Especially since I still have bad memories of trying to clean the hood with other methods and it taking forever. Don’t let Super Clean dry on the surface. Immediately wipe it off using a moist paper towel that has water on it. This also helps remove streaks. You need to watch my video to see for yourself how crazy awesome this is. I’m still in AWE of the before and after!! This cleaning solution is awesome and works every time. We also have a great tutorial showing how to clean an oven – which is equally helpful! Been dreading cleaning up the BBQ pit. Think I’ll buy some of this to do the job! Thanks for all your great info. I make my own cleaner. 1/4 amonia, 1/4 rubbing alchohol, 1/2 water in a spray bottle. I make mine a little stronger but this works. I use it for everything!! Have done this exact thing with it as your video. Also great for washing and disinfecting things like kids toys, counters, sinks, tubs and floors. Need scrubbing power, use with baking soda sprinkled first or after spraying. Your hood looks great. Awesome formula Karen. 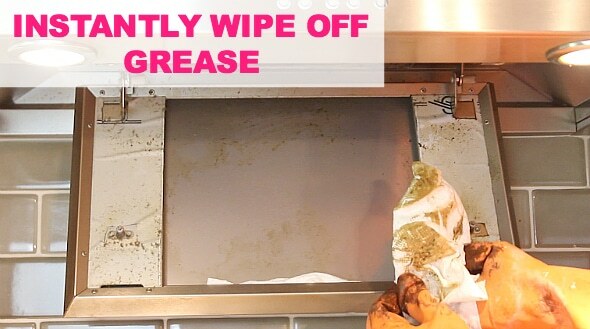 Thanks for sharing your recipe for taking grease off pretty much anything. It’s amazing how grease can get into the tiniest spots, especially with cooking!! that is wicked funny that you just happened to come up with this posting, right after I took off my range hood and exhaust thing. We are working on doing the kitchen over, and yesterday I removed the vent hood, only to find, man oh man that is so cruddy and nasty! I don’t even think the metal recycler would take it for all that nast. I wanted to try cleaning it up before taking it to the salvage guys, and I do have a trip to Walmart slated for later this week. I’ll mos def get back to you on my results! Glad you happened to do this posting! I have always had excellent luck with a bottle of alcohol and a roll of paper towels. Wait, what kind of alcohol Theresa, haha. Just kidding. So do you use rubbing alcohol with the towels to get the grease off? Jeff, you always do such great tutorials but this was exceptional for its shortness! I hate cleaning up greasy stuff, too, so I’m going to do this little project when I get back from Lowes. Thanks for posting! Thanks Sally. It was pretty darn short. And that’s what I want when it comes to cleaning projects. Something that doesn’t take forever. Hope you have the same results as me. It looks remarkable how easy the grease came off. Do you think I could use that on the grill inside hood too? It’s worth a try. Do a little pre-test on a small are (like 2 x 2 inch) and see what it does. I enjoy your Friday tips. They are always helpful. I need some tips on resurfacing an asphalt driveway. Should I get a professional or try to do myself. Any recommendations on the products to use? Boy, I wish I could help you Bud but that’s out of my zone of expertise. Maybe someone else can comment on your question. I’d probably get a professional to give me an estimate and see if it’s worth it. Ask some friends if they’ve used someone for a similar project. Is your driveway wavy and needs holes filled? Or is it mostly a cosmetic fix? Can you use this onthe outside of a s/s hood range? I have a Viking hood over my range and I can never get if cleaned without streaky. Do you think this would work? You could give it a try Suz. Since your hood is a Viking make sure to do a small test (like a 1 by 1 inch!!!) – those bad boys aren pricy. The Super Clean will streak but I used the wet paper towel afterward and got it looking like new. I bet you’ll get similar results. Jeff can you use this on the old grease that is on the tile behind the stove? It should work Tammy. What kind of tiles do you have? If they have a glazed finish then you’ll be good to go. Most tiles behind a stove are very resistant and should discolor. But test a small area to make sure the Super Clean doesn’t do any harm. I bet you’ll be fine and the grease will come off pretty easily. Can Super Clean be used to remove grease from kitchen cabinets? If not, what would you recommend? I also could not find Super Clean at Walmart in Burlington WA. Hi Norman, you should be able to use it on cabinets but always test it on a small spot to make sure the paint or finish won’t get ruined. You could also check auto parts stores. There’s a good chance they might have it. Super Clean is my go-to cleaner. You are right to warn about testing it for compatibility. If left to sit for too long, it will actually etch glass and it will remove paint where you don’t want it to. Trust me, I know! But no other cleaner works this well. It even takes oil spots off the driveway. I buy the gallon jug and refill my spray bottle. I was afraid to try it on my hood filters because they are made out of aluminum, I think. But now I’ll give it a try. Thanks! Thanks Deb for the warning about etching glass, whew that would be bad. I need to try Super Clean on oil spots on my driveway. For some reason I forgot about using it for that purpose!!! Amazed to see the finshed results. I too would love to try out this Super Clean.I don’t like to cook in a smelly kitchen so I cleanse up my kitchen everyday. You’ll like it Maria. It was pretty darn awesome. Hi. I live in NZ and this product is not available here. 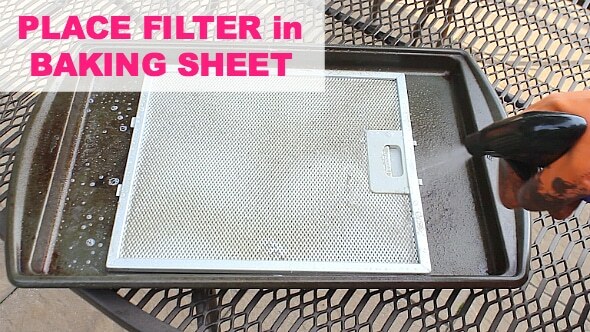 I clean my filters in the dishwasher and use full strength ammonia to clean the greasy surfaces. The ammonia cuts through grease easily using a cloth and hot water to rinse it. Use gloves, ammonia is hard on the skin. A few months ago I had great success cleaning the range hood with a mixture of water, baking soda, and a bit of dish soap. You can soak the filter in the mixture and it comes clean on its own. Baking soda is really good at cutting grease (I use it on cookie sheets all the time). I also put the filter through the dishwasher and that works pretty well too for maintenance. Awesome tips Deanna. Thanks so much. Thanks Anthony. I love trying new products and if Greased Lightning worked for you then I’ll give it a shot. Jeff, I just happen to be in the automotive section of my local “box store” and I spotted a bottle of Super Clean. Hmmm, this is the stuff that Jeff P, liked so much. Well, I gave it a try on the over the stove vent filter (which I thought was clean) and holy grease and grime Batman, that stuff worked great. Spay it on, let it sit, a little tjuzs from a paper towel, then rinse it off. Voila! That filter was sparkly clean. I’ve worked in a lab for the last 30 years so I had to check the MSDS sheet (Material Safety Data Sheet) on this product and there (IMHO) is nothing that would be considered a “scorch the earth” type of chemical in it. Now that doesn’t mean safety precautions should be ignored with this product, but I’ll definitely be using this on greasy messes in the future. Thanks for the find, Jeff. Thanks for checking the MSDS and letting me know it’s pretty safe. It’s so cool that we found something that works wonders on old grease. their website states they have a triple guarantee: you can send it back to the company (if it doesn’t work) and they will refund purchase price AND shipping costs to return the product. I like a company that puts their money where their marketing is…. I found super clean about 20 years ago at the 99 cent stores and was blown away at how well it worked. It is made by Castro oil oil company. Your advice is great – for those that can get to the inside of their vent hood, but is not for those with a Sirius vent, with no access except to remove the light fixtures and bring wiring down through the holes – which leaves you access through 2 holes that are about two inches in circumference! I keep the filters in, and easily wash them in our dishwasher, but – Grease drips down on the stovetop from the light fixture holes!!! This vent is powerful, as we wanted, but no one told us that one needed tiny hands to get in under the interior metal sheet which holds the filters, and which is sharp, and that there was no way for grease to get away. We have contacted the cabinet maker (local and no help ), contacted the company that sells the product in this country (no longer sells this model, (go figure) which was not inexpensive), and now we have a fire hazard, and cannot afford to replace the hood, just to be able to clean up inside it. Any suggestions? I have thought of drilling several drain holes, and just catching the drips. Oops. Make those light fixture holes 2 inches in diameter. I just found your website! And though this post was created a year and a half ago, I thought I’d add to the discussion for any future readers. Though I haven’t tried this “Super Clean” cleaner you speak of, a mixture of water and Arm & Hammer washing soda (you can get it at Walmart for $2 a box; it’s in the laundry detergent aisle) works wonders at removing that greasy crud off of vent hoods & hood screens. Follow the directions on the box and soak the vent screen like you did with the “Super Clean” cleaner. Use the H2O & washing soda mixture to wipe down the vent hood with it. Easy peasy, no harsh fumes, and it’s CHEAP! A few caveats: Make sure to wear rubber gloves when using this product and do not use washing soda on aluminum, fiberglass products, or waxed/varnished surfaces. P.S. 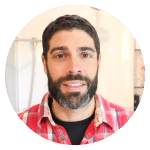 I forgot to add, I love all the information you give on your website that I bookmarked several posts to help with some DIY projects that my husband & I need to do around our house. Thanks for a great source of info! We were looking for a way to degrease our range hood and stumbled upon your YouTube video. We decided to try the product. I’m not easily impressed, but this stuff worked great! Good as new! Thank you! I also stumbled upon your video and website and I want to thank you for your advice! I went into Autozone to return something and right in front of the cashier was Super Clean. I used it on my stainless steel backsplash and the inside of the hood and it worked wonders! Thank you so much! Hey great video and info! My range hood and filter are way, way overdue for a good degreasing/cleaning. Would this product be safe on a hood that is not stainless steel? Question asked. Is it safe for a mom stainless steel vent above stove? If you’re in doubt about using super clean on your range hood (the parts other than the filters) it is quite safe to use Metholated Spirits on paper towels, but for your own piece of mind do a small test first. “Meths” (as we call it in Australia) is great for wiping off streaks and finger marks from stainless steel appliances, as well as cutting through the grease on these surfaces. Nice and informative article. I was looking for some information regarding this and finally got one. Thanks for sharing the information with us. The article was a great help to me. it was worth reading. Thank you, thank you for your DIY write-up on exhaust hood degreasing using Super Clean. What a product! Our hood looks brand new. No more smelly, gummy grease with dust build-up from years of use. Tried cleaning other methods only to have the gummy grease smear all over. Super Clean just melted away the grease/grime. Thank you again. One thing I researched and found that will definitely change your life when it comes to cleaning your oven anyway. I use a little bit of liquid ,water, vinegar whatever you choose.then take a PUMICE stone, that’s right a pumice stone like one you use when your doing your pedicure. Scrub the ceramic with the stone, it will literally take any burnt on food off instantly. And the pumice stone will not scratch the ceramic coating in your stove. please try it, I promise you will be happy! If your stove is pretty bad, then it may break up the stone, but buy a new one,it’s totally worth it. I use a product called AWESOME found at the dollar store or K Mart. and it works extreamly well for anything. especially tough jobs like this. My husband also uses this for tough jobs outside like cleaning lawnmower grill etc. Nothing like it and it cost only &1:00 for a large bottle. Thanks Ida for the tips!